The image is played back via the PKI 5725 digital receiver with built-in digital video recorder. With the 3.5″ (8.9 cm diagonal) TFT monitor you can immediately look at the recorded signals or also file them on the up to 16 GB SD card. Various recording modes, such as secure (MONITOR OFF), timer, endless, motion-dependent, audio or video only, allow recordings of up to 150 h. Via USB, audio (mono / stereo) and video output (PAL/NTSC), it is possible to connect a PC, larger monitors and further equipment without problems. 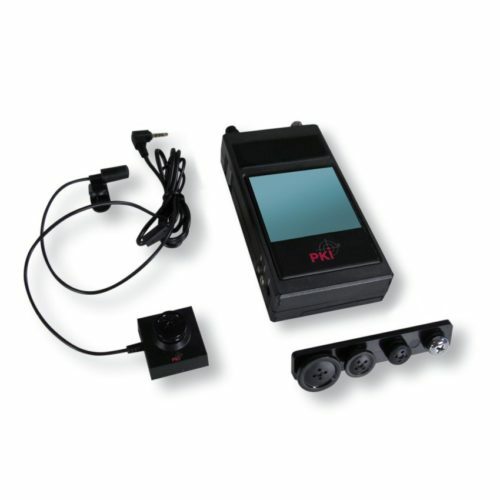 The pinhole camera PKI 5730 is directly connected to the AV input. The built-in 4- channel radio receiver enables the reception of our radio camera modules. The highly sensitive receiver still operates perfectly even with the weakest signals.